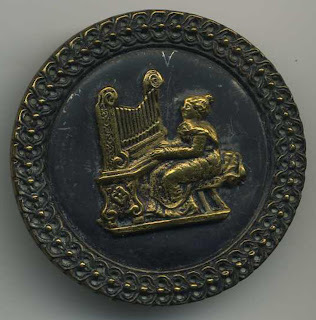 Stamped brass button on a metal background which was originally painted and mounted inside a wide decorative brass border stamped with a chain-link pattern. Saint Cecilia is the patroness of musicians and Church music because, as she was dying, she sang to God. It is also written that as the musicians played at her wedding she "sang in her heart to the Lord". 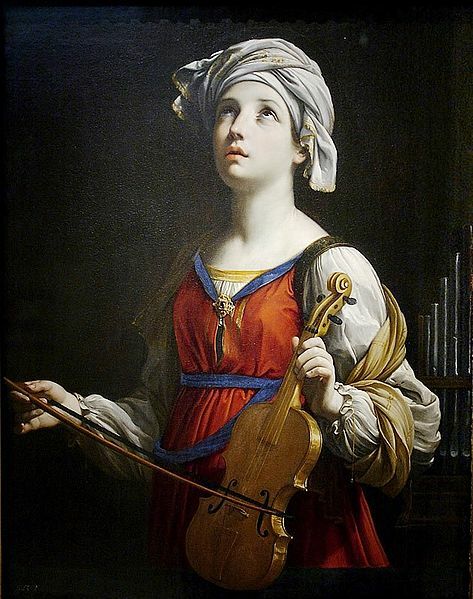 St. Cecilia was an only child. Her feast day is celebrated in the Roman Catholic, Anglican, Eastern Orthodox, and Eastern Catholic Churches on November 22. She is one of seven women, excluding the Blessed Virgin, commemorated by name in the Canon of the Mass. It was long supposed that she was a noble lady of Rome who, with her husband Valerian, his brother Tiburtius, and a Roman soldier Maximus, suffered martyrdom in about 230, under the Emperor Alexander Severus. The research of Giovanni Battista de Rossi, however, appears to confirm the statement of Venantius Fortunatus, Bishop of Poitiers (d. 600), that she perished in Sicily under Emperor Marcus Aurelius between 176 and 180. A church in her honor exists in Rome from about the 5th century, was rebuilt with much splendor by Pope Paschal I around the year 820, and again by Cardinal Paolo Emilio Sfondrati in 1599. It is situated in Trastevere, near the Ripa Grande quay, where in earlier days the ghetto was located, and is the titulus of a Cardinal Priest, currently vacant. The martyrdom of Cecilia is said to have followed that of her husband and his brother by the prefect Turcius Almachius. The officers of the prefect then sought to have Cecilia killed as well. She arranged to have her home preserved as a church before she was arrested. At that time, the officials attempted to kill her by smothering her by steam. However, the attempt failed, and she was to have her head chopped off. But they were unsuccessful three times, and she would not die until she received the sacrament of Holy Communion. Cecilia survived another three days before succumbing. In the last three days of her life, she opened her eyes, gazed at her family and friends who crowded around her cell, closed them, and never opened them again. The people by her cell knew immediately that she was to become a saint in heaven. When her incorruptible body was found long after her death, it was found that on one hand she had two fingers outstretched and on the other hand just one finger, denoting her belief in the Holy Trinity. The Sisters of Saint Cecilia are a group of women consecrated religious sisters. They are the ones who shear the lambs' wool used to make the palliums of new metropolitan archbishops. The lambs are raised by the Cistercian Trappist Fathers of the Tre Fontane (Three Fountains) Abbey in Rome. The lambs are blessed by the Pope every January 21, the Feast of the martyr Saint Agnes. The pallia are given by the Pope to the new metropolitan archbishops on the Solemnity of Saints Peter and Paul, June 29. 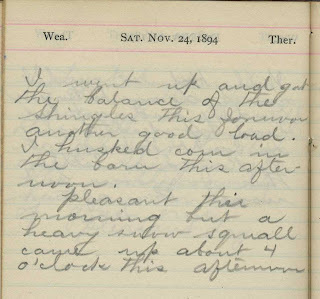 “I went up and got the balance of the shingles this forenoon another good load. 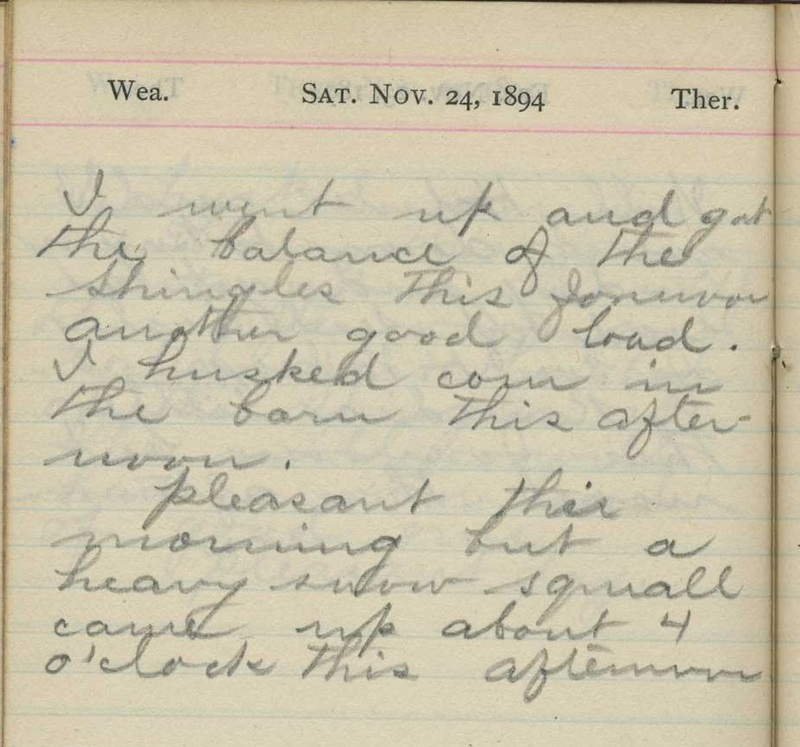 I husked corn in the barn this afternoon. Pleasant but a heavy show squall came up about 4 o’clock this afternoon.